Scientists at the University of Sussex have disproved the existence of a specific type of axion - an important candidate ‘dark matter’ particle - across a wide range of its possible masses. The data were collected by an international consortium, the Neutron Electric Dipole Moment (nEDM) Collaboration, whose experiment is based at the Paul Scherrer Institut in Switzerland. Data were taken there and, earlier, at the Institut Laue-Langevin in Grenoble. “Experts largely agree that a major portion of the mass in the universe consists of ‘dark matter’. Its nature, however, remains completely obscure. One kind of hypothetical elementary particle that might make up the dark matter is the so-called axion. If axions with the right properties exist it would be possible to detect their presence through this entirely novel analysis of our data. “We’ve analysed the measurements we took in France and Switzerland and they provide evidence that axions – at least the kind that would have been observable in the experiment – do not exist. These results are a thousand times more sensitive than previous ones and they are based on laboratory measurements rather than astronomical observations. This does not fundamentally rule out the existence of axions, but the scope of characteristics that these particles could have is now distinctly limited. It has been believed for decades that axion particles might make up at least some of ‘dark matter’ – the stuff that we know is in our universe but which cannot be seen. Axions are important because finding them, if they exist, could hold the key to why the universe has lots of matter but relatively little antimatter. Equal amounts of matter and antimatter would have been created when the universe began, and it should all have mutually annihilated, but the Universe clearly now has plenty of matter – but essentially no antimatter – left over; we do not understand why. This is the first experiment to use laboratory equipment – rather than astronomical observations – to investigate this type of axion. Previously, physicists had been gradually narrowing the range of possible masses of the axion through telescope-based experiments. The research published today wipes out a whole swathe of potential masses. As a result, particle theorists attempting to explain the origins of the Universe and the nature of dark matter will have to go back to the drawing board as they revise, constrain and tune their models. An important benchmark has been set for future experimental searches; and other experiments, working in related topics, will be able to analyse their data in this new way to extend the sensitivity further. The data were collected for another purpose – to look at why the universe is dominated by matter and not antimatter – when it was realised that the measurements could be used to search for the presence of axions too. The experiment worked by trapping neutrons, then applying a high voltage to their container to see whether it affected the rate at which they spin. A change in this rate would indicate that they have a distorted structure – and changes in that distortion over time (from minutes to years) would indicate that there were axions present. No such distortions were seen, and therefore no axions were detected. The nEDM experiment itself is a “classic” in particle physics, having run in one form or another with ever-increasing sensitivity since 1950, and ruling out many theories along the way. It is one of the most sensitive measurements that it is possible to make, and Sussex-led measurements have provided the world’s best sensitivity continuously since 1999. "In our original experiment we took a single measurement and repeated it many times to determine the average value over a long time. When we’re searching for axions, we watch for whether the measurement fluctuates over time with a constant frequency. If so, it would be proof that there had been some interaction between the neutron and the axion. We never saw that. " The experiment does not rule out the existence of axions entirely. Firstly, the axions would need to have interacted strongly enough with the neutrons for any change in its rotation rate to be spotted. Secondly, their mass might either be larger or smaller than expected. It does, however, provide important new constraints, and it points the way forward to future avenues of investigation to help resolve one of cosmology's great outstanding mysteries. 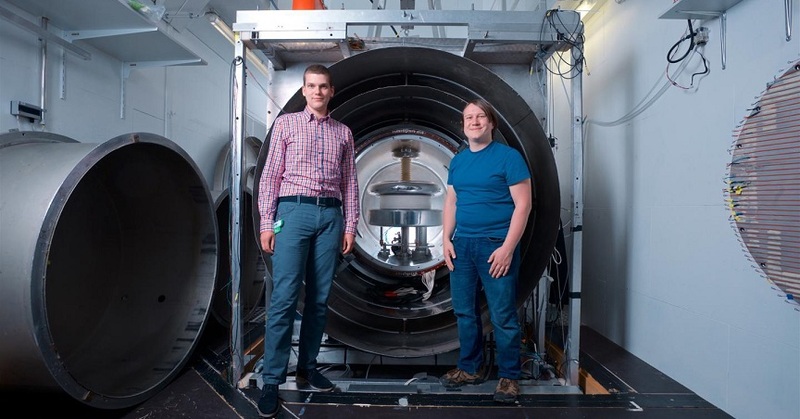 These experiments make an important contribution to the search for dark matter.